The North Central Massachusetts Chamber of Commerce has always had strong roots in community activities and specialties. We strive to constantly discover what makes our region special! Our passion for the area led us to create a central visitor information program called The Johnny Appleseed Trail Association or JATA for short. Twice a year the JATA organization publishes the Johnny Appleseed Trail Guide. The guide includes information about hospitatliy locations and activity oriented businesses through-out North Central Mass, it is essentially the handbook for things to do while visiting the region. In addition to publishing this valuable information, JATA also has a comprehensive website that tells you everything you need to know to stay active, have fun, and love life in North Central Massachusetts! 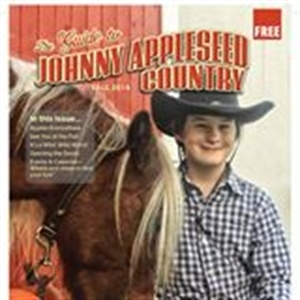 We encourage both residents and visitors to our area to check out www.appleseed.org and see what there is to do in Johnny Appleseed Country. Includes Cities/Towns: Ashburnham, Ashby, Ayer, Fitchburg, Groton, Harvard, Lancaster, Leominster, Lunenburg, Pepperell, Princeton, Shirley, Sterling, Townsend, Westminster. Jan 13.0 F° 22.8 F° 32.5 F° 3.7 "
Feb 15.5 F° 25.9 F° 36.3 F° 3.4 "
Mar 23.7 F° 33.9 F° 44.1 F° 4.1 "
Apr 34.5 F° 45.4 F° 56.2 F° 4.2 "
May 44.8 F° 56.5 F° 68.2 F° 3.9 "
Jun 54.4 F° 65.5 F° 76.5 F° 4.1 "
Jul 60.1 F° 70.8 F° 81.5 F° 4.0 "
Aug 58.1 F° 69.0 F° 80.0 F° 4.0 "
Sep 49.2 F° 60.6 F° 72.0 F° 3.9 "
Oct 37.3 F° 49.0 F° 60.7 F° 4.4 "
Nov 29.7 F° 39.6 F° 49.5 F° 4.3 "
Dec 20.1 F° 28.8 F° 37.6 F° 3.9 "
Spring temperatures are cold with averages in the mid 40's and highs in the mid 50's. Nights are cold with lows in the mid 30's. Summer temperatures are mild with averages in the upper 60's and highs in the upper 70's. Nights are cool with lows in the upper 50's. Fall temperatures are cold with averages in the upper 40's and highs in the low 60's. Nights are cold with lows in the upper 30's. Winter temperatures are cold with averages in the mid 20's and highs in the mid 30's. Nights are cold with lows in the mid 10's.